Welcome to Wednesday which means it’s time for the Small Steps Amazing Achievements linky. Thank you to everyone that linked up last week. 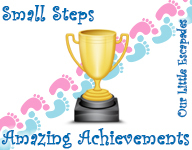 It’s my turn to host this weeks Small Steps Amazing Achievements. Jeannette’s Small Steps Amazing Achievements Highlights from last week.